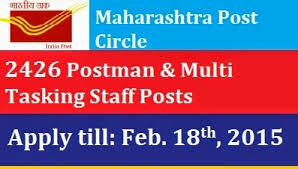 Maharashtra Postal Circle has published recruitment notification for 2426 Postman, Mail Guard, MTS Posts. All eligible and interested candidates can apply from online on or before 18-02-2015 (18th February 2015). More detailed information on educational qualifications, the selection process examination Pattern, Syllabus, age limit. Maharashtra Postal Circle Recruitment 2015 – 2426 Postman, Mail Guard MTS Post mentioned below. Candidate’s age should be between 18-27 years. Age relaxations will apply according to the rules. Candidates must have completed 10/12 / ITI or its equivalent qualification from a recognized university. Salary Range: Rs 5200-20200/- With 1800 /- 2000 /- Salary Grade. All eligible and interested candidates can complete the application online through the official website http: //www.davp.nic.in before or on 18-02-2015. Registration deadline of the online application form is: 18-02-2015.